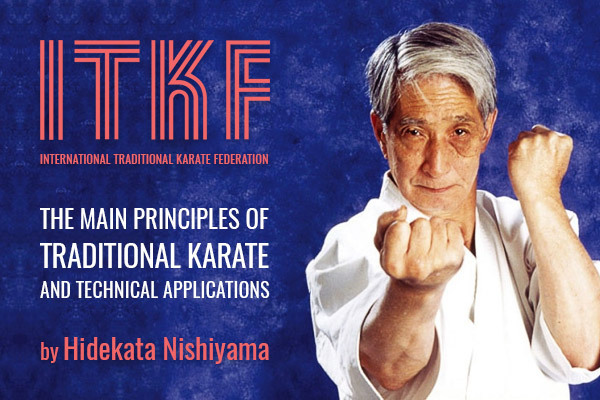 In documentul prezentat, Principii de Karate Traditional si aplicatii tehnice de Karate - "Main Principles of Traditional Karate and technical applications by Hidetaka NISHIYAMA" publicat in 2001, am pastrat limba originala in care a fost publicat documentul pentru a transmite cat mai corect nuantele si intelesul acestuia. This text is a guide to the application of Traditional Karate's underlying principles to its techniques. Keep the body's axis extended through the body's center of gravity and further extended through the supporting surface. The acceleration of gravity through the compression downward of the stomach muscles creates the maximum pressure toward the floor. This combined with the External Force reaction makes the Final Power - KIME. Remark: When delivering a "shock" technique, utilize total body musculature contraction at moment of impact thus tuming body momentarily to "steel. Remark: When withdrawing the kicking leg, don't drop knee until the initiation of the next technique. While the supporting leg contracts downward to floor, other leg squeezes upward utilizing stomach muscles focused from body's center of gravity. After completing one technique, don't discontinue breathing but maintain unbroken exhalation and focusing of KI power toward opponent for next technique of combination. After the completion of a technique, don't lose connection to next technique. Maintain contraction and pressure to floor in order to flow into next technique. Maintain "looking eye" feeling toward opponent. Project one's "Ki" energy toward opponent. MIKIRI - estimate opponent's mental and physical movement. Eye first, feet second, spirit/courage then power/technique fourth - Traditional martial arts proverb. KI - Mind and Technique/power must be blended together. During opponent's attack, detecting kyo and executing counter technique. Catching opponent in state of "Kyo" at the initiation of attack. Executing technique upon sensing opponent's mental commiment just before initiating his attack. Executing technique when detecting KYO upon opponent's initial physical movement to attack. Executing technique end of opponent's attack in between attacking techniques or catching and blocking initial attack before next attack begins. Making KYO by breaking opponent's mental and physical balance with continuous attacks.